A new exhibition on New York’s artist-run galleries reminds us of a vibrant but now distant past. In the early 19th century, French art seemed to have a solid and smoothly functioning institutional framework organized around the Royal Academy, the École des Beaux-Arts, and the annual salons, at which the works of accredited artists were displayed; their most important patron was the French state, and small-scale private collectors were few and far between. By the end of that century, a new system was beginning to take shape, one that relied on a network of private collectors and critics who came from outside the established institutions. Later dubbed the “dealer-critic system,” it helped popularize and champion the radical new art of Impressionism. Both the book and the densely hung rooms at the Grey, which are full of paintings, sculptures, and drawings by artists who exhibited in these improvised galleries, offer a useful corrective to the oversimplified art-historical narratives on which we all too often rely unthinkingly. If you accept that in the wake of Pollock, Kline, Rothko, et al., ambitious young painters in New York in the 1950s were working abstractly, only then to begin incorporating found materials into their work with the arrival on the scene of Robert Rauschenberg and Jasper Johns, leading directly in turn to the Pop, Minimal, and Conceptual art of the 1960s, think again. At the Grey, no one approach to art, abstract or figurative, dominates. Images and abstraction, paint and objects commune promiscuously here, with seemingly every intermediate position on the spectrum sampled and every combination tried out. The artist-run galleries of downtown Manhattan were far more catholic in their sympathies than our latter-day art history would allow. Rachleff sees the March 1953 exhibition of Willem de Kooning’s “Woman” paintings as a watershed moment for the New York art scene, heralding a reconsideration of the abstraction that had marked the previous decade. “De Kooning’s independence from critical rhetoric gave artists permission to follow their own concerns, without regard to critically designated ‘movements,’” she writes. De Kooning’s work is not included in the exhibition, as he was already a senior figure by the time the independent artist-run spaces began to proliferate in the early 1950s. But as other artists of his generation were consolidating their “signature styles,” he offered a powerful model for how productive it could be to evade categorization and slip between modes. This indifference to categories and a will to juxtapose putatively antagonistic styles is perhaps what gives “Inventing Downtown” a sense of visual cacophony—a stirring one if you’re willing to plunge into it on its own terms. It’s not the kind of show you’d come to hunting for masterpieces. There are some terrific things to see here: for instance, Alex Katz’s Ada Ada (1959), a double portrait of the artist’s wife standing in a blue dress against a nebulous off-white ground, or Ed Clark’s Paris Series #4 (1966), a sweeping abstraction whose horizontal bands of color are neither lines nor shapes exactly, but somehow pure manifestations of movement. But the show also includes any number of half-baked experiments, youthful misfires, or inadvisable manifestations of what Greenberg called “spasmodic feeling, high spirits and the infinite subdivision of sensibility”—­some of them by artists who have since been lost to view, others by figures who would later become known for quite different work. “Inventing Downtown” is among other things a reminder that the old adage “the good is the enemy of the great” is an insidious fallacy; here we see that the good—and even the not-so-good—is the terroir that gives the great art of any given time and place its inimitable local savor. All of this would have been irritating to an observer like Greenberg, for whom the “Tenth Street touch” represented exactly what to avoid in painting: the “close-knit variations or gradations of light and dark” that give much Abstract Expressionist painting (but also the kind of painterly figuration that flourished downtown in the ’50s) “its typical density of accents and its packed, agitated look.” That agitation and density were inseparable from the effort to register the rough texture of urban life that Greenberg had at first appreciated in the art of Pollock, but which became increasingly distasteful to him as he began to see elsewhere the potential for an American version of the “bland, large, balanced, Apollonian art” of which he dreamed. The best way to approach “Inventing Downtown” is to follow the curator’s lead and see it not as an exhibition of works or even of artists, but of places—or rather, of a unique kind of place: those exhibition venues that sometimes move from place to place but always reflect a confluence of artists who elected to exhibit their work together. Some of the best-known among them, including the Tanager Gallery, Brata Gallery, and Hansa Gallery, were structured as cooperatives; the artists shared the expenses of the gallery as well as the decision-making and some of the labor. Others were simply the studios or living spaces of artists who invited colleagues to show their work. For instance, the City Gallery was part of Red Grooms’s loft on Sixth Avenue, and 112 Chambers Street was Yoko Ono’s studio. Other groups used donated spaces, like the Judson Gallery, which Marcus Ratliff (later a prominent graphic designer) started with Jim Dine and Tom Wesselmann at the Judson Memorial Church on Washington Square. The finale of “Inventing Downtown” is devoted to the Green Gallery, a commercial gallery on 57th Street whose founder, Richard Bellamy, had been the hired director of the cooperative Hansa (which itself had moved uptown during the course of its seven-year existence). Bellamy became a key figure in the New York art world and was known as “one of the remarkable, eccentric personalities of the city.” A recent biography, Judith E. Stein’s Eye of the Sixties: Richard Bellamy and the Transformation of Modern Art, offers a sympathetic portrait of an unconventional figure more adept at understanding art and artists than at the business of running a gallery. But in Rachleff’s telling, the Green Gallery—remembered as the launching pad for many Pop artists, among them James Rosenquist as well as co-op veterans like Wesselmann, and the Minimalists Donald Judd, Dan Flavin, and Robert Morris—­portended the end of the heroic era of artist-run spaces downtown, as commercial success elevated a few of their denizens while marginalizing the majority (including many women and people of color). Within the infectious hubbub that characterizes the exhibition as a whole, each of the 14 featured galleries reveals its own more or less capacious character. The Tanager Gallery, for instance, discovered a bent toward a painterly lyricism that remained closer in spirit to the École de Paris than was generally approved of in a postwar New York eager to declare its cultural independence from the Old World; something similar was true of the Hansa Gallery, founded by former students of Hans Hofmann, perhaps the main conduit between the early-20th-century European avant-gardes (Cubism, Expressionism, Matisse) and the New York scene from the 1930s until he closed his school in 1958. At Hansa, some fragile-looking collages by Robert Whitman, who would later become known for happenings and large-scale installations, seem like geometrically straightened-out descendants of Kurt Schwitters’s Merz collages. Jacques Beckwith, an artist previously unknown to me, is represented by a small, very attractive untitled painting from 1959, a sort of abstracted landscape subtly composed of delicate touches of overlapping colors, eliciting a poignant expressive quality through limited means. By contrast, the exhibits from the two galleries run by Red Grooms—the City Gallery was succeeded by the Delancey Street Museum when he moved to the Lower East Side—tend toward a rowdier energy and are harder to classify, driven as they were by the influence of outsider and folk art; Lester Johnson’s dark, heavily impastoed 1955 Self-Portrait is a striking example. 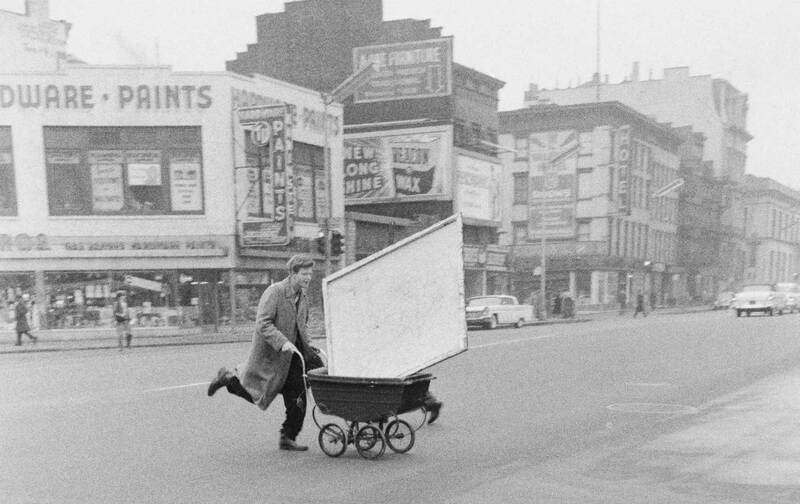 In a 1958 article on the legacy of Jackson Pollock, Allan Kaprow called on his fellow artists to “utilize the specific substances of sight, sound, movements, people, odors, touch” and, rather than only representing them in paint, to see that “objects of every sort are materials for the new art: paint, chairs, food, electric and neon lights, smoke, water, old socks, a dog, movies, a thousand other things that will be discovered by the present generation of artists.” The Reuben and Judson galleries, as well as Ono’s 112 Chambers Street, became places to fulfill this prophecy in a new art of happenings, performances, and three-dimensional walk-through environments by the likes of Grooms, Whitman, Claes Oldenburg, and Simon Forti (as well as Kaprow and Ono themselves, of course). At the Grey, these happenings find only a pale representation by way of drawn scores, photos, and digitized films; the drawings and paintings from this milieu share a raucous and spontaneous quality quite distinct from the deadpan, koan-like concurrences typical of the happenings, “an art of radical juxtaposition,” as Susan Sontag called them at the time. As the ’50s edged into the ’60s, some of the artist-run galleries began to take on a political edge. Notable here was the March Gallery, whose leading figure was Boris Lurie, a Russian-born survivor of the Nazi camps who proclaimed an art of protest, of negation—an artist whose aesthetic was just “to strongly react against anything that’s bugging you.” It would be futile to criticize his art for the crudeness of its attack—that was the point. Less abrasive approaches to political art were featured at another Judson Church offshoot called the Hall of Issues, where another former Hofmann student, Phyllis Yampolsky, invited “anyone who has any statement to make about any social, political, or esthetic concern” to hang their work. The most artistically vital of the politically oriented factions to emerge downtown in the ’60s was certainly the Spiral Group, the circle of black artists who gathered at Romare Bearden’s loft on Canal Street. In a way, it’s surprising to see them as part of a downtown movement—one might have more readily imagined them meeting in Harlem, the setting for much of Bearden’s imagery. Like Bearden, the other original core members of the group (among them Hale Woodruff and Norman Lewis) were already in their 50s and 60s when they began meeting (unlike the other downtown groups, which were mostly populated by newcomers to the scene), though younger artists were subsequently invited to participate. The focus was on discussion rather than exhibiting. And in contrast with the March group and others, their work did not center on political subjects; in a sense, their existence as black artists was in itself contentiously political, to the extent that they could not come to a consensus about how to conceive the relation between their aesthetics and their politics—they were searchers, not proclaimers. “Inventing Downtown” is a messy show, and a lot of the art that’s in it is messy too—about as far from Greenberg’s imagined Apollonian blandness as you can possibly imagine. Better still, it shows that art’s history is messier than most of its chroniclers are willing to allow. Here’s a scene that could have gone in many directions—it’s the one that Pop and Minimalism came from, defining an internationally recognized mainstream, but it could have just as easily mutated instead toward a focus on the kind of imagist painting that took root in Chicago, or the assemblage art that became more closely associated with the San Francisco Bay Area. “Inventing Downtown” reminds us of a past moment when the New York art scene was scaling up to dimensions that would have seemed unthinkable to its prewar denizens, yet in retrospect looks intimate and close-knit. It’s easy to feel nostalgic, but that’s not the point. “Downtown” as it existed then, or as it still existed in the late ’70s when, as a teenager, I happened upon the punk-music scene headquartered at CBGB, no longer exists. There are no more cold-water flats either, and no one misses them, but places in which to carve out space and create an intensely interactive community around the passion for art have become almost nonexistent in the city. Some people think Hudson, New York, could be the next “downtown.” Others point to Philadelphia, Baltimore, Detroit… But I don’t think a mere geographical shift is the answer. Now that real-estate interests have identified artists as the avant-garde of gentrification—­something unimaginable in the 1950s—creating a new downtown elsewhere has become an exercise in futility: By the time you unpack your boxes, the rent goes up and you’re forced to move again. What we do need, though, is for a new system to start taking form. For all we know, what finally emerges may resemble today’s galleries as little as the galleries resemble the salons and academies of the 19th century. In 1961, as the artists of New York were struggling toward the limelight, Marcel Duchamp was advising the opposite: “The great artist of tomorrow will go underground.” No one was listening. But somewhere, perhaps, an old mole is digging a new burrow. *Editor’s Note: As of March 17, 2017, the exhibition is no longer scheduled to travel to Switzerland.